West Side Story is an American musical with a book by Arthur Laurents, music by Leonard Bernstein, lyrics by Stephen Sondheim and conception and choreography by Jerome Robbins. It was inspired by William Shakespeare's play Romeo and Juliet. The story is set in the Upper West Side neighborhood in New York City in the mid-1950s, an ethnic, blue-collar neighborhood. The musical explores the rivalry between the Jets and the Sharks, two teenage street gangs of different ethnic backgrounds. The members of the Sharks, from Puerto Rico, are taunted by the Jets, a white gang. The young protagonist, Tony, a former member of the Jets and best friend of the gang leader, Riff, falls in love with Maria, the sister of Bernardo, the leader of the Sharks. The dark theme, sophisticated music, extended dance scenes, and focus on social problems marked a turning point in American musical theater. Bernstein's score for the musical includes "Something's Coming", "Maria", "America", "Somewhere", "Tonight", "Jet Song", "I Feel Pretty", "A Boy Like That", "One Hand, One Heart", "Gee, Officer Krupke", and "Cool". The original 1957 Broadway production, directed and choreographed by Jerome Robbins and produced by Robert E. Griffith and Harold Prince, marked Sondheim's Broadway debut. It ran for 732 performances before going on tour. Robbins won the Tony for his choreography and Oliver Smith won for his scenic designs. The show had an even longer-running London production, a number of revivals and international productions. A 1961 musical film of the same name, directed by Robert Wise and Robbins, starred Natalie Wood, Richard Beymer, Rita Moreno, George Chakiris and Russ Tamblyn. The film was nominated for eleven Academy Awards and won ten, including George Chakiris for Supporting Actor, Rita Moreno for Supporting Actress, and the Best Picture. This warm a cappella arrangement beautifully portrays the emotion and thrill of falling in love for the first time. From the Leonard Bernstein classic West Side Story, this is a welcome addition to the TTBB repertoire. The music from Leonard Bernstein's landmark Broadway musical West Side Story has become an important part of our musical heritage. With lyrics by Stephen Sondheim, these two songs create a powerful showcase for choral groups in schools and communities. Available for SATB, SAB, SSA, Instrumental Pak (parts for Trumpet I & II, Tenor Sax, Trombone, Synthesizer, Guitar, Bass and Drums) and ShowTrax CD. Performance Time: Approx. 5:00 HL00450075 is the SAB edition. 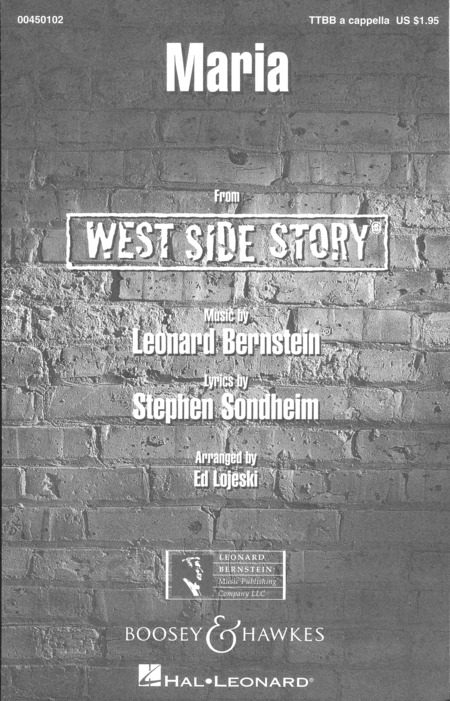 The music from Leonard Bernstein's landmark Broadway musical West Side Story has become an important part of our musical heritage. With lyrics by Stephen Sondheim, these two songs create a powerful showcase for choral groups in schools and communities. Available for SATB, SAB, SSA, Instrumental Pak (parts for Trumpet I & II, Tenor Sax, Trombone, Synthesizer, Guitar, Bass and Drums) and ShowTrax CD. Performance Time: Approx. 5:00 HL00450076 is the SSA edition. 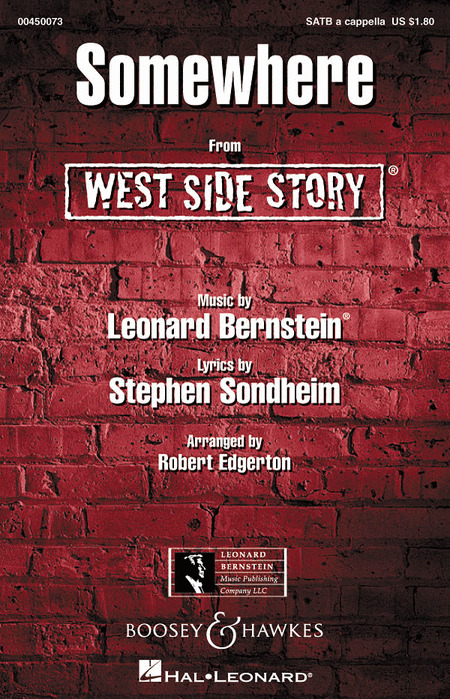 The music from Leonard Bernstein's landmark Broadway musical West Side Story has become an important part of our musical heritage. This 20-minute choral suite in four sections offers vivid and emotional contrasts along with some of the most beautiful and beloved melodies the Broadway stage has ever produced. Songs include: Something's Coming; Tonight; Maria; One Hand, One Heart; I Feel Pretty; Cool; America; Somewhere. Available separately, SATB, SAB, 2-Part and ShowTrax CD. Instrumental Parts available as a digital download. Duration ca. 18:00.